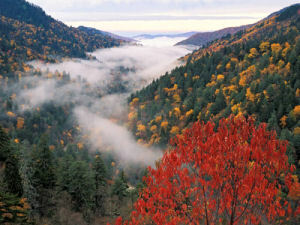 The land of Tennessee stretches from the scenic Great Smoky Mountains of the east 440 miles to the banks of the Mississippi River in the west. Within Tennessee's 42,145 square miles of scenic beauty and diversity lives the greatest variety of birds of any state in the union. But it is not just the amazing variety of birds that fill the air with song. Music is one of Tennessee's major traditions and attractions. 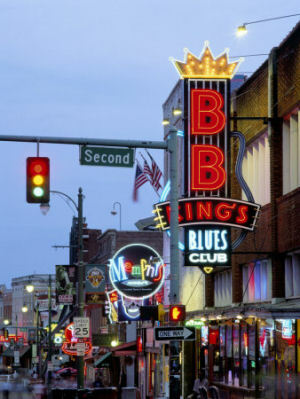 Memphis holds the title "Birthplace of the blues". Nashville hosts more than a hundred recording studios, and is famous as the country music capital of the world. From Elvis Presley to the Grand Ole Opry, from blues to bluegrass to country, music is an integral part of the soul and sound of Tennessee. Yes, music is alive in Tennessee and is evident in the official state symbols that have been approved through legislative resolution or have been signed into law. With no less than eleven official state songs, Tennessee makes sure that it leads the rest of the states when the band begins to play. The state of Tennessee was named after the Little Tennessee River. Originally "Tanasi" the river took its name from two Cherokee villages on its banks. This is the most widely recognized nickname for the state of Tennessee and one of the most revered. This nickname was earned, during the War of 1812, when thousands of Tennesseans enlisted in response to Governor Blount's call for volunteers. It also honors the courage of Tennessee soldiers fighting under General Andrew Jackson in The Battle of New Orleans (Jan 8, 1815). This nickname is a reference to the the Indian name for the Tennessee River, "The river with the big bend". This proud nickname refers to the role Tennesseans have played in shaping this country's national government. Many elected and non-elected national offices have been held by Tennesseans including the office of the President of the United States. Three presidents have called this state home; Andrew Jackson(7th), James K. Polk(11th), and Andrew Johnson(17th). You won't hear Tennessee called the Hog and Hominy State very often today and, in fact, this nickname is considered obsolete. It refers to the time when Tennessee was a major producer of corn and pork products; between 1830 and 1840. "Probably its origin and application to this State are in some way connected with the life and activities of Andrew Jackson." People who live in Tennessee or who come from Tennessee are called Tennesseans or Tennesseeans. Tennesseans have also been known as "Volunteers", "Big Benders", or even "Butternuts." The first two names are obvious references to two of the state's popular nicknames. The third, "Butternuts," probably originated during the War between the States and is reference to the tan colored uniforms of Tennessee soldiers. On January 14, 2002, Governor Don Sundquist joined U.S. Mint Director Henrietta Holsman Fore and Treasurer of the United States Rosario Marin at the Country Music Hall of Fame to unveil the 16th state quarter in the 50 State Quarters® Program, honoring the musical heritage of the "Volunteer State. The Tennessee quarter was the first quarter to be released in 2002. A banner reading "MUSICAL HERITAGE" is what this coin is all about. Featuring a trumpet, a guitar and a fiddle on a background of sheet music, the coin is a clear tribute to the contributions that Tennessee has made to the American music collage. The trumpet represents the jazz and blues contributions of western Tennessee preserved in the Beale Street Historic District of Memphis. The guitar represents the Country Music tradition of central Tennessee where the world-renowned Grand Ole Opry makes its home in Nashville. The fiddle represents the Appalachian music of eastern Tennessee and the Great Smokey Mountains. The date, 1796, that appears at the top of the coin under "TENNESSEE", is the date that this state, the 16th to do so, became part of the United States of America. Tennessee (From Sea to Shining Sea) , By Myra S. Weatherly. 80 pages. Publisher: Scholastic Library Publishing (December 2001) Reading level: Grades 3-5. Presents information about Tennessee's people, geography, history, landmarks, natural resources, government, state capitol, towns and cities, and more. Tennessee (World Almanac Library of the States) , by Barbara Peck. 48 pages. Gareth Stevens Publishing (January 1, 2002) Reading level: Grades 4-6. Filled with the most up-to-date information, including the latest Census results. Full-color photos bring to life the story of Tennessee. In addition to an in-depth factual profile of Tennessee in the form of a state Almanac, this book offers fascinating and lively discussions of the state's history, people, geography, government, economy, culture, and lifestyles. A section on Notable People, a calendar of events, and enough primary source documents, time lines, maps, and other tools to make this unquestionably the best young adult reference material on the USA available anywhere. The Tennessee Encyclopedia of History and Culture , edited by Carroll Van West. 1193 pages. Publisher: Thomas Nelson, Inc. (July 1, 1998) This definitive encyclopedia offers 1,534 entries on Tennessee by 514 authors. With thirty-two essays on topics from agriculture to World War II, this major reference work includes maps, photos, extensive cross-referencing, bibliographical information, and a detailed index. Tennessee History: The Land, the People, and the Culture , edited by Carroll Van West. 469 pages. Publisher: University of Tennessee Press (Spring/Summer 2001) This volume presents a variety of fresh perspectives on the peoples, periods, and major events of Tennessee history. Featuring contributions by both established historians and rising young scholars, the twenty essays contained here explore new avenues of research and interpretation while considering the forces that have shaped society and culture in the Volunteer State over the past two hundred years. Drawn from the pages of the Tennessee Historical Quarterly, these essays offer a well-balanced look at the state's vibrant past. The book will prove an invaluable resource for teachers, students, researchers, and general readers. Tennesseans and Their History , by Paul H. Bergerson, Stephen V. Ash, and Jeanette Keith. 357 pages. Publisher: University of Tennessee Press (October 1999) The history of Tennessee is full of dramatic episodes and colorful characters that give the Volunteer State a major place in the American saga. From the bloody battle of Shiloh in 1862 to the Dayton "monkey trial" of 1925 to the assassination of Martin Luther King in Memphis in 1968, Tennessee has been the locale for many of America's most important events. Tennessee: A Short History , by Robert E. Corlew. 636 pages. Publisher: University of Tennessee Press; 2 Updated edition (December 1990) Tennessee has a fascinating history, animated by such colorful personalities as Daniel Boone, Davy Crockett, and Sam Houston, and many distinguished statesmen, three of whom have served as president of the United States. All are portrayed in this carefully researched volume, which examines Tennessee's past and suggests new directions for the state's future. An updated version of the 1981 edition, Tennessee: A Short History, traces the development of the Volunteer State from its beginnings to the present. Starting with the prehistoric Indians, the author recounts the problems incident to statehood, deals with the traumatic developments of the nineteenth century, including the Civil War and its aftermath, and discusses the multiple changes in the social, cultural, political, and economic structure of Tennessee in the twentieth century. This one-volume work will serve as a primary sourcebook for the state's history for many years to come.